Aesthetically, Kinect Sports falls somewhere between Wii Sports and the Playstation Move's Sports Champions. Kinect Sports uses your recently lengthened Xbox 360 avatar to represent you in the games, and the rest of the visuals follow suit. The gameplay, too, is meant to be colorful and animated, not a simulation of the athleticism required to actually play a sport. In the game you'll find no oddball sports, just the meat and potatoes of soccer, boxing, track and field, table tennis, bowling and volleyball. None of the games offer the sort of depth you'd find in a game like Madden, but that doesn't mean they're not fun. This is perfect for anyone willing to stand in front of a camera and go through the motions of playing a sport. Kinect Sports is the Wii Sports and Move Sports Champion of the Xbox 360. It's made by the people who used to make games for Nintendo, Rare. How can you live with yourself without knowing how Kinect's sports game compares to its peers? And why didn't Microsoft bundle this, instead of Kinect Adventures, with Kinect? Controller free sports sounds interesting, how do you play these games? Is the controller responsive enough? It's a neat premise. You stand in front of your television until Kinect recognizes you and then you wave your hand around to choose the sport you want. It's important to know that when I stood eight feet from the TV, Kinect Sports still wasn't delighted with the amount of space in which I had to play. That may be why the menu interface was a bit skittish for me, with the cursor skittering around as I tried to select a sport. Once I got into a particular sport, the controls were mostly accurate. And that's OK for some of the games. Some of the games? OK let's go through all. How was soccer? This was a lot of fun. Rare made some smart design decisions here, essentially turning the game into a sort of third-person foosball. That doesn't mean you're connected at the hip to a row of players. It means that the game focuses on passing, blocking and shooting. When you have the ball, you get to kick it a set number of directions, each marked with arrows on the ground. Once you're close enough to shoot, you can kick wherever and however you'd like. You block by trying to move in front of your opponent's kick which is also marked with an arrow. When you're in control of the goalie you have to block or catch the ball, which pops up as an icon after the shot is made. It takes a bit of getting used to, but once you find the flow of the game it's quite a blast. How was volleyball? This was my favorite of the bunch. You serve by making a tossing motion with one hand and a swinging motion with the other. Once the ball is in action you get to bump, set and spike it back and forth. The game marks where the ball is headed and leaves it up to you to decide if you're going to try to bump it or knock it over immediately. Volleyball is a real ceiling scratcher when played with Kinect, getting you to move around much more than any other game on the disc. Kinect Sports lets you save and upload video of you playing to the Kinect Share website. Bowling is on the Wii and Playstation 3 Move. How was it? How did it compare? Not well. Because Kinect is tracking your body movements and interpreting them, it doesn't seem to do as good a job at handing the finesse of putting spin on a thrown bowling ball. I found I had to throw across my body to get it to work, but then It would gutter the ball. So I then started aiming for the opposite gutter and throwing across my body for spin. The fact that you have to so exaggerate your movements to do anything outside of a straight bowl is a bit disappointing. What about boxing? Was it anything like Punch Out? Boxing is one of those games that is quite a bit of fun to play... when it works. The problem is that the game sometimes seems to glitch out, not sensing your hand movements properly and missing the fact that you may be blocking high or low or trying to throw specific punches. When it works it sings, but when it doesn't it's crushingly disappointing. There's also no fancy footwork in this game, you can only control your hands. Suger Ray would be stunned. You said the many events of track and field. That sounds like it's pretty packed with mini-games. How is it?Overall it's great. The sport includes running, javelin throw, long jump, discus and hurdles. Once you get used to the idea that running really fast in front of the TV doesn't equate to running really fast in the game, the rest is gravy. This isn't meant to be a sports simulator, and it's in track and field that that is most obvious. Running is more about the rhythm than the speed, discus and javelin seem more about angles and timing than strength. Once that sinks in, track and field is a blast. How was table tennis? Table tennis was surprisingly fun. After having so many issues with spin in bowling, I thought there was no way that Rare would be able to get that to work in the back and forth of table tennis. I was wrong. The game picks up forward and backward spin effortlessly and the fact that you can move around in front of your end of the table just by moving around in the room adds a lot to the experience. How do the games handle when you're not playing them alone? All of the sports seem to handle better with just one person in front of the camera. Once there are two of you playing side-by-side some of the sports get a bit wonky. I found this to be exacerbated when one player was an adult and another a child. Perhaps because of the striking height difference. 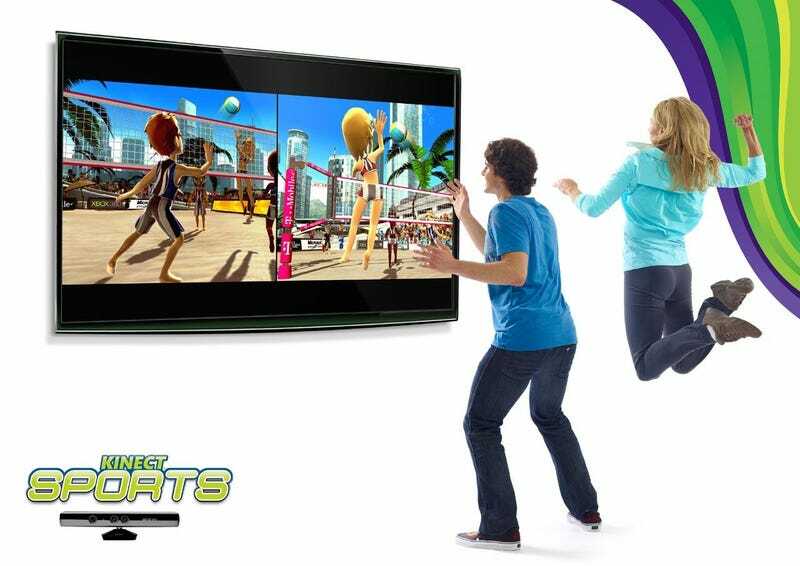 Kinect Sports offers an interesting variety of games to play alone and with friends. It's fun when it works, but it doesn't always work. Having a bowling ball or a javelin stick to your hand or a boxer have a sudden spasms can ruin the experience. In the end that's going to be the greatest challenge this Kinect game faces. A great experience, no matter how fun, can't survive working only most of the time. Kinect Sports was developed by Rare and published by Microsoft Game Studios for the Xbox 360 Kinect, released on Nov. 4. Retails for $49.99. A copy of the game was given to us by the publisher for reviewing purposes. Played through multiple matches in all of the sports. Played alone, with people on the same console and online. Played about 8 feet from the camera.